6th January 2006 - will it be the first severe storms experienced near Sydney? 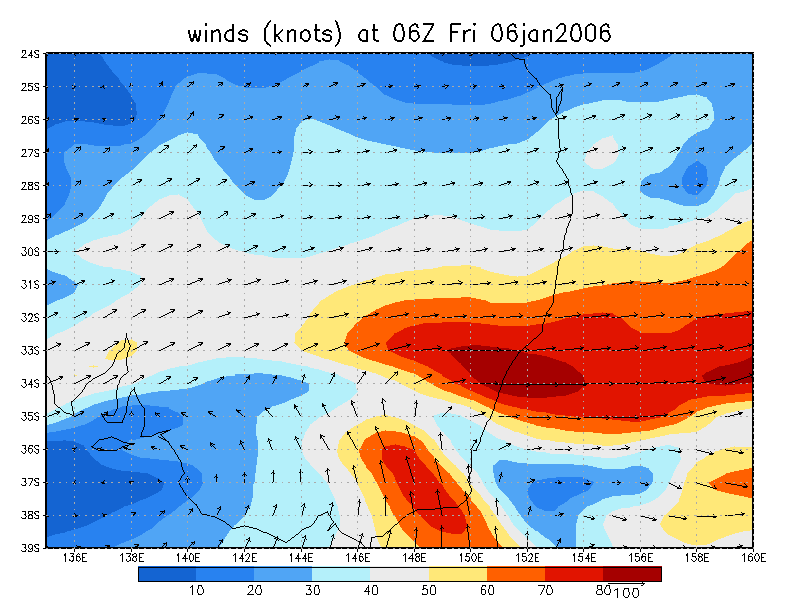 Topic: 6th January 2006 - will it be the first severe storms experienced near Sydney? GFS is unfolding an scenario of possible severe weather with obviously some good rainfall. Instabilities due to destabilisation indicate that anywhere from the South Coast to the Mid North Coast and part so the adjacent tablelands will experience some storms or severe storms. Large hail is possible in these regions but I doubt it would exceed a few centimetres in diameter. Storm motions will be NE to NNE. I especially like the direction the anvil will be directed. The cap however will allow for early development further south being too weak. We'll see how latter models unfold the situation. Feel free to input some technical comments (no one liner updates - full reports, forecasts and and accurate desciptions thanks). Re: 6th January 2006 - will it be the first severe storms experienced near Sydney? Jimmy, I would have though that the anvil level winds were not so ideal for long lived stroms today. Reasoning is that with a WSW or SW wind at anvil level you have rainfall dropping into the inflow zone which is obviously not good for long lived storms. Maybe if the anvil level winds were more westerly it would be better but the models even this morning were still suggesting WSW to SW. I'm also not a fan of the weak instability. -2 Li's and only 800-1000 cape is not all that great and so you can forget about explosive development. I think that even with the approaching upper trough there won't be any really strong storms as the forcast max 700/500 lapse rate is only 16 degrees and the trough is decidedly positive in it's tilt. Sorry about the late reply but i've too much on atm. Very nice structured severe storm this afternoon! And a nice dumping of hail as well in the Goulbourn and nearby vicinity. Great afternoon's chasing. The upper trough levering through easily could be observed in the behaviour of the storm. It went from a whispy storm to a very consolidated and larger severe storm. Lightning behaviour and structure / organisation occurred simultnaeously! I am not sure I agree with the interference of the anvil on this occasion Jeff? In fact my thoughts when forecasting were the exact opposite - the mental hodograph seemed to favour cleaner storms. The only reason why the storm was not longer lived was due simply to the undercutting of the outflow seing that the pre-storm environment was in a E-SE regime. I take it it went more SE behind. The storm developed in the vicinity of the destabilisation region as the upper trough progresed north at a time when the most rapid destabilisation occurred but it also developed along this wind shift line. The heating was not a problem with temperatures in the region of about mid to high 20s - quite ideal for an altitude of 600m - 700m. But the models were suggesting a north easterly pre-storm enviroment I thought, and if the anvil is dumping rain toward the north east due to south west winds aloft than it seemed to me to be not such a good situation. The anvil - I take at about 300hPa had west winds which is what interested me the most. The storm motion which was anticipated hence my positioning did help keep the storm clean. Of course the cold outflow eventually undercuts. I've attached a link for the 300mb chart for the 6th form your website. At 34 degrees latitude it was suggesting a very strong westerly jet streak. But further south at 35 latitude it was suggesting anything from west south west to south west at 06z. Latitude 35 being just south of Goulburn and where the storm inititated. But the jet streak on the day was obviously a little further south than forcast at 06z and it was ever slight west north west in orientation as I remember from the radar image showing the anvil from your storm moving in a east south east direction. Great discussion. You have moved slightly away from the original discussion as to why you did not like the concept of chasing on this day as compared to what happened in hindsight. The storm had weakened I think by 06Z. Could you provide the 03Z to 06Z run. This storm developed just ahead of the upper trough axis. The jet although was weaker in strength was in existence until it collapsed. As an aside, we have to also consider the physical properties of a sharp upper trough. Do you think it is more likely that there be a sudden shift in wind direction rather than a gradual wind shift to SW and then S? Are we looking at this in 2D or 3D considering that the stonger winds driving the could be at a different level - any comments from others? I do admit perhaps the model was not absolutely perfect on timing... We also must consider that the model PERHAPS works on averages and does not deal with anything but linear acceleration changes. So perhaps the jet was meant to lag a little and then accelerate rapdily by 09Z for instance. By the way being the summer it is, one cannot throw away too many opportunities. However, if this storm situation occurred near Eden, I would have thinked twice to chase considerig the fuel. Geoff and I did enjoy the quick exit from Sydney using the M7 Westlink!